"Forest Hall, Historic Columbia River Highway, Oregon"
Click image to enlarge Forest Hall, Columbia River Gorge, Oregon. Image taken March 3, 2013. Forest Hall, also known as "Maxwell House", was built in 1915 and was one of the many roadhouses along the Columbia River Highway. Forest Hall was located 1/4 mile east of Shepperd's Dell. Today it is a private residence. "... a stately structure that opened for business in 1916. Built as a restaurant by Nettie Arnold and Anne Hibler, Forest Hall later came into the possession of Elsa Maxwell, who operated the restaurant as the Maxwell House for many years. The historic structure, owned by Patrick and Patricia Brothers, is now a private residence. 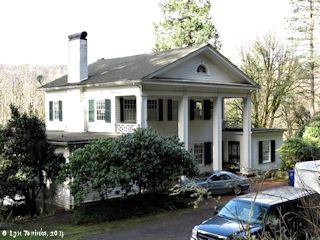 ..."
"A cool, restful Colonial house in a setting of big fir trees, with the Pillars of Hercules in the background and the Pallisades rising across the Columbia River. On the east is a court enclosed by a delicate lattice-work of fine Colonial design, in the center of which stands a large fir tree. In the west wing is is an enclosed veranda, daintily furnished, adapting itself admirable to the comfort and convenience of guests. The interior -- a scene from the old South -- mahogany which graced a stately plantation home, known as Forest Park, near Lexington, Kentucky, when the pioneers were first making their way over the Oregon trail, silver and glass and old-fashioned flowers. Miss Ann Hibbler is a hostess one delights to meet, gentle and courtesous. Black Eva, who presides, was one of the famous cooks of Kentucky before she transferred her art and traditions to the West." Source: "Official Columbia Highway Tour", 1916, Published by The Scenic Tours Company, Portland, Oregon. 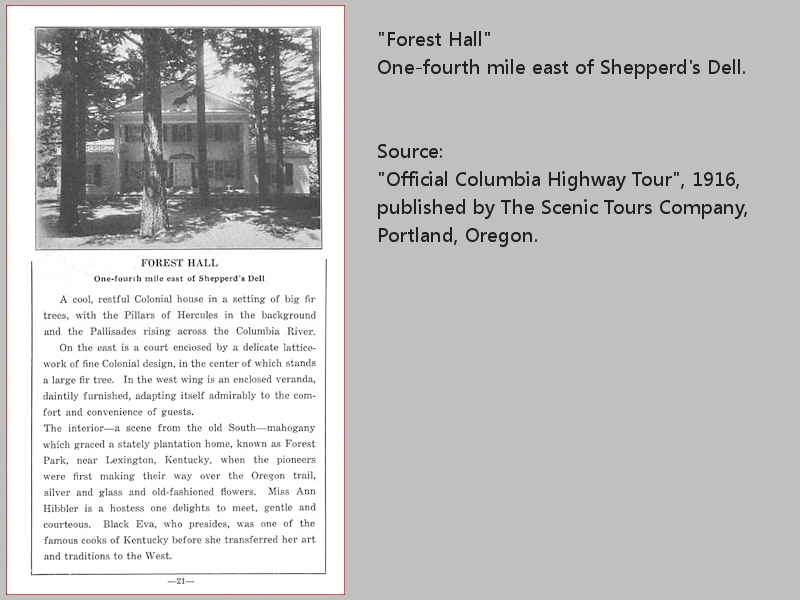 Click image to enlarge Forest Hall, ILLUSTRATION, "Official Columbia Highway Tour", 1916. Source: "Official Columbia Highway Tour", 1916, published by Scenic Tours Company, Portland, Oregon. 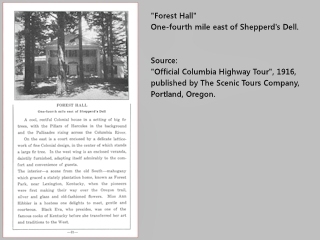 "Forest Hall", "Forrest Hall", and "Faresh Hall" have all been names referring to today's "Forest Hall", with "Forest Hall" first appearing in advertisement in the "Morning Oregonian" in June 1916. During the 1930s and 1940s the eatery was called "Maxwell House". Unique and distinctive; culture and refinement of home; simplicity and restfulness are everywhere apparent. Large, attractive fireplace, spotless linen, polished silver and beautiful cut glass contribute to the hospitality which abounds here. Beautifully furnished with old-time crotch mahogany. Eva, the colored cook, is an adept in preparing famous Southern dinners. Fried Spring chicken our specialty. Dinners served at 7 P.M. It is urgent that you phone in advance in order that preparation will be made for your pleasure and entertainment. Phone Long Distance "Forest Hall Station." Source: Advertisement appearing in the "Morning Oregonian", June 25, 1916, courtesy Oregon Historic Newspaper Archives, University of Oregon. To the best of my online research, I could only find the name "Faresh Hall" appearing in 1981 and 1985. The first was in the community of Corbett's 1981 "Timber Winds" publication, produced by Corbett High students. Another reference appeared in the 1985 National Register of Historic Places Nomination Form for the View Point Inn. In contrast, the use of "Forest Hall" appeared in an advertisement in June 1916 in the "Morning Oregonian", the major newspaper of the area. To date (late 2014), I could find no other reference to the name "Faresh". As you drive down the Scenic Highway towards Multnomah Falls, you may see a stately white hosue to the left. It stands out because of its immense size and beauty. Its architecture is almost classical, with large white pillars across the front. Its once huge double doors were replaced by the present owners in the course of their remodeling. A history of the house was given to us by Marty Meredith, the former owner of the house. "(Some) people by the name of Arnold and Hibler had (the) home built for them in 1917 [in error, 1915] by a builder by the name of Cook. The home was named 'Faresh Hall' at that time and was opened as a restaurant-type roadhouse." "The Arnolds then sold their half of the house to Mrs. Herrencohle and her daughter, Anne, and it continued to be a restaurant. A Mrs. Montgomery from Vancouver, Washington, purchased the house and it sat (run) down and idle til Elsie Maxwell bought (it), we think about 1937. Elsie ran the home as a special dinner and guest house." "Elsie sold it about 1947 to some people by the name of Peterson. (The) Petersons tried to run the restaurant, but it failed. Mrs. Maxwell told us people just wouldn't drive that far for a $2.00 chicken dinner." Mr. and Mrs. Mitzel and (their) two grown children bought the house for a private home. Mrs. Mitzel passed away, and Mr. Mitzel sold the home to Mr. Auker and it was (run) as a rest home. Mr. Auker then sold it ti Mr. and Mrs. Hitchman, (both elderly). "Mr. and Mrs. John Noble and (their) two small children bought the house in approximately 1960. (The) Nobels sold the home to us, (Mr. and Mrs. Ed Meridith), in 1969." The Merediths did extensive renovating to the home for a number of years, and later sold it to Mr. and Mrs. Alder, the present owners. Source: Patti Hanson, 1981, "Faresh Hall", IN: "Timber Winds", vol.1, no.2, Spring 1981, Corbett, Oregon. "Timber Winds" is the product of the students at Corbett High School. "... Among the jewels of the highway and a focal point for tourists were Vista House and Crown Point. Crown Point is a basaltic promontory of the Columbia Gorge. It was one of the two sites where the highway was dedicated between Troutdale and Hood River in 1916. Atop Crown Point stands the Vista House (1918), an observation point for the Gorge. Vista House was designed by the architect Edgar Lazarus following Samuel Lancaster's suggestion that an observation point be placed at Crown Point. Famous resort inns such as the Chanticleer Inn on the site of the Portland Women's Forum Park, the Crown Point Chalet above Vista House, the Wayfarer Inn in Corbett, and Faresh Hall in Bridleveil arose to serve the tourists. From Portland, rental touring cars and limousines were available from the Columbia River and City Sightseeing Service to bring tourists to the area. ..."
Source: National Register of Historic Places Nomination Form, View Point Inn, 1985, #85000367.